things must Know when you moving from blogger to WordPress.blogger to WordPress migration move your posts from blogger to wp within minutes almost no downtime and without losing visitors, SEO may affects. Here what I mentioned that when You move from blogger to WordPress. Once you moved to WordPress how to do you use same URL permalinks of blogger version. Redirecting blogger now getting difficulty. depending on your servers some plugin won’t works. If you are blogger blog got deleted, and don’t have the backup. then backup your data using google cache, archive.org will not work efficiently. we have to remove the “?” parameter / redirect using the .htacess. Blogger redirect plugin won’t work for if old blogger deleted. Placing the code above in 1st line worked. Asking strat configuration for blogger imported posts. Redirecting Individual URLS with Redirect plugin worked for some URLs. but this is not the solution. however my blog is very small and 4 URLs are broken I have fixed with that plugin. Moving WordPress process following these steps. this process may be done easily with Softaculous configured in CPanel or upload extract manually from WordPress.org after installing website copy meta descriptions title and keywords. Importing blogger posts from WordPress using blogger importer tool. Go to WordPress Dashboard select Tools to choose blogger importer Go to WordPress Dashboard select Tools to choose blogger importer it will ask your email and password for import blogger posts also Google ask for confirmation. 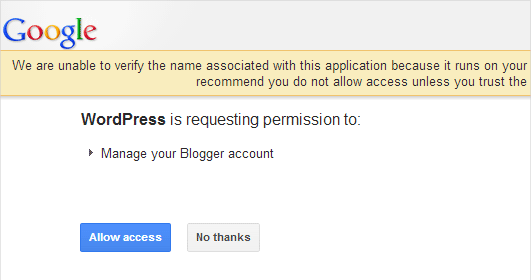 after you grant access you need to select one if you have more than blog spot blogs in your blogger account. you may import all blogger blogs data into one WordPress blog. you can export blogger XML file. if the above authorization doesn’t work due to auht2.0 of google. you can redirect with this plugin permalink finder, or redirect plugin. without adding any code to template.php or without editing.htaccess. but here you need to focus on this wisely because in future you want to change your permalink structure in WordPress only post name or Post name/post_id or category/post name you may also interest in the best permalink structure for SEO in WordPress. for permalinks go settings and choose permalink structure. After choosing permalinks, you need to create PHP file for redirecting blogger URLs to new WordPress URLs create the blogger.php file and upload it to WordPress installed directory themes folder which WP-content>> themes. it will redirect all old blogger URLs to your new WordPress URLs. edit your old blogger template and select revert to the classic template and edit the HTML code replace with below code. Adding the above code to blogger templated violates blogger policies and it will get delete soon. Moving blogger to WordPress done recommended plugins for redirection permalink redirection which is not get 404 error redirect into relevant URL. But here what the things I want to mention. the major thing is redirected blogger blog will delete due to blogger terms of service. because I faced this asked blogger they replied this is one of spam method redirecting another. Google shows your old blogger permalink structure I am facing this since 1 year. also index Google mobile format URL which year/month/post name.html?m=1. You may lose your traffic in my case when I moved blogger to WordPress to Google indexing crawling lazily in blogger when posted an article that website it indexed in seconds. but now in WordPress indexing time take 1 day or more sometimes XML sitemap plugin in WordPress not update when you update content. you may also check debug function in that plugin. if you are reused your old blogger blog content on blog spot which is exported blogger data. if you import this to another blogger blog why you do this because totally permalink structure changed. old content is there is without any purpose why don’t I park this blogger. if the you do this your new WordPress blog ignores in Google index and blogger platform blog gets rank until you changed the content of on WordPress site if you totally changed your content on your WordPress blog. blogger parked domain also loose traffic. this also experienced. if you Newbie you don’t now technical experience I don’t recommend WordPress because there are lots of plugin errors, especially with your hosting provider. some of the plugins use more memory also check limits beyond shared hosting. in my case in shared server if I get more than 500 servers I get 508 service resource limit reached they block your database or directory host gator uses process limit if you cross the limit you will get 500 internal server error. if this happens frequently they will suspend your account not pay any money you may refer Hostgator terms of service. if you moved to WordPress there is no way come back to blogger read my post about how to move WordPress to blogger. More customization, attracting themes, plugins, self-hosted platform, SEO Friendly (Do more..) WordPress powers 85% of the web. better SEO if you think of this. Google recently not crawling meta tags like keyword, announced by Google Matt Cutts. but the website description clearly index in Google snippet in results. Google algorithm very complexity and also its depends on more than 200 factors. blogger blogs are more active in Google results than WordPress because it’s owned by Google. more customization especially themes lots of people attract here really this feature to WordPress bunch of WordPress themes available better than blogger. Hosting Problem Plugins using much of memory. I am on WordPress since 2 years moved it from blogger. for the last 2 years not ranked very pretty in google. the same site in blogger platform daily hitting 1000 above visitors daily 2012.
when it I moved to WordPress getting almost 50-100 per day.because I lost 301 redirects blogger blog old deleted by bloggers team because it’s violated their terms of service. can be done here. but it’s educational because its supports only 1 MB data. otherwise, you can split your WordPress exported XML files 1 MB parts and convert it from http://wordpress2blogger.appspot.com/ and import to blogger one by one.